It is with a heavy heart that I address this topic, as America is the greatest nation on earth. And that is simply because we care about other people, both in our own country and those in countries around the world. We are the "Land of the Brave & the Home of the Free" or at least we used to be. And we are blessed by God. One of the problems I think, is because of our affluence, we have, in many cases, become "Gods unto ourselves," 0r at least our present government and the Democratic House and Senate have become "Gods" in their own eyes. Before the 2010 elections, when Democrats got back control of the congress, they passed whatever they wanted, when they wanted to, and how they wanted to regardless of the wishes of the American people. They passed bills that they had not read, they had secret meetings behind closed doors, and made secret deals, to get their agenda passed. They made promises and used bribes to get members of Congress and the Senate to change their votes. Or they outright bullied and intimidated those who refused to do what they were told. This sounds like a "Dictatorship" to me, rather than a Democratic Government. And when the big bills were being debated they passed other equally important bills when no one was looking. They lied, they cheated, they bullied, they went back on their word, and they apparently hate the United States Constitution. In a word, our government has become CORRUPT. WHERE are the courageous Americans like the ones who won the Civil War, or World War I and World War II? Are we going to let a handful of people (around 546) dictate our lives? The Bible teaches that " A house divided against itself cannot stand." which basically is what is happening in our government. We definitely have become a "House divided against itself" and if we don't unite we will not stand. There seems to have crept into our government a real EVIL PRESENCE, which is the best way I can describe it. You can see this presence, hidden behind a false smile, on the faces of some of our leaders. And in years past, I feel that some of our leaders, even past Presidents, fit the definition of a Narcissistic/Psychopath. Not the "serial killer" type of Psychopath, but the manipulative, con artist, business type of Psychopath. The ones who wear "business suits" and who could live right next door to you. In the old days they were called "smooth talkers." The Bible calls them " Wolves in sheep's clothing." Jesus warned us to "Be on guard, against prowling lions who are seeking to devour you." 1.) They are charming, charismatic, egocentric, manipulative, cunning, callous, and KNOW EXACTLY WHAT THEY ARE DOING. They can lie without any remorse because they have no conscience, but can turn themselves into a "chameleon" to fool whomever they are talking to. They look like the real thing, but underneath they are "Wolves in sheep's clothing." 2.) They are glib and superficial. 4.) They demonstrate a lack of remorse or guilt. 5.) They demonstrate a lack of empathy. 6.) They are deceitful and manipulative. 7.) They have shallow emotions. 8.) They are impulsive, have poor behavior controls, and have a need for excitement. 9.) They lack responsibility and when caught in a lie, they blame someone else, and declare themselves innocent, and then tell another lie to cover up the first lie. 10.) They have early behavioral problems in childhood and as an adult they demonstrate antisocial behavior, meaning that they make up their own rules, rather than follow those of society. 11.) They say one thing and do another. 12.) Their words and their actions do not match up. 13.) They become whatever you want them to become, say whatever they think you want to hear, make promises they have no intention of keeping. 14.) They see people as "objects to be used"
15.) They can fake emotions, but in reality they have no conscience, feel no guilt or shame, have no remorse, and cannot show genuine compassion or empathy for others. Can you think of any of our past Presidents or current leaders in the House and the Senate that seem to demonstrate some, if not all of these characteristics? The past Democratic administration in the White House was so arrogant, so psychopathic and incredibly narcissistic that they covered up the murder of four Americans in Benghazi. Are you kidding me? Four dead Americans that they refused to help and save their lives, and now they are trying to cover it up? Not to mention the IRS, National Security Scandal, etc. And can you imagine what we don't know about that this past administration has done and covered up? We had a woman presidential candidate in the Democratic Party who has hidden her e-mails on her own private server in her home and is refusing to turn them over to Congress. She has put the national security of this nation and the lives of millions in severe danger! Her narcissism/psychopathic character actually believes that she can get away with this and still become our next President! Wake up America! Open your eyes!! She is so narcisistic that she is actually thinking of running again in 2020! Psychopaths do not feel normal emotions, so they study other people to see what emotions to fake as the situation calls for it. Which is why they practice "crying on cue", "laughing on cue", "looking sad on cue" etc. But it is all an "act." Because they have no emotions or feelings at all, they are like robots without souls. And unfortunately narcissistic/psychopaths can be politicians as well as serial killers. They can be your next door neighbor or your minister or your policeman. There are millions of them in America. They are seeking to get control of our country. The last administration was composed of a bunch of Marxist Czars appointed by Obama and approved by no one, running the government. They all but destroyed our country and our Constitution. They are systematically taking away our freedom. Which is why God allowed Donald Trump to be elected because he is going to clean out all the corruption that is in Washington, D.C. One only has to turn on the tv to see the liberal media going after him time after time as he slowly gets rid of all the corrupt psychopathic/narcissistic politians. And just like Christ, he is being "crucified" on a daily basis. America needs to WAKE UP and get back to reality and truth. Because the number one goal of any psychopath is to "take care of number one, mainly themselves". They see other people as "objects to be used," who can be dropped at a moment's notice when they are no longer serving the needs of the psychopath. It is scary at just how good they are at fooling others. This is why we had several of the presidential candidates being accused of "saying one thing one day, and the complete opposite the next." They will say whatever the crowd that they are in front of wants to hear, because their goal, is to get their vote so they can take control of the nation by dictatorship. Rather, than being a "true politician" who really cares about America, who does not say what the people want to hear but what they NEED to hear, regardless of whether he gets their vote or not. And this is because they actually CARE about America! The Bible teaches that God Himself appoints our leaders. But it also teaches that sometimes, God has allowed bad leaders to get elected because the nation needs to be reprimanded and suffer the consequences of disobedience to God. In the Old Testament, in the history of Israel, you will see alternating good and bad leaders of Israel, depending on how obedient the nation as a whole was to God. And this is what is wrong with America and our government. We have a democratic party in the government now that has sold their souls to the devil, in exchange for fame, power, and wealth. The COMPLETE OPPOSITE of everything that American once stood for and believed in. And when a nation kicks out God from the equation and becomes their own GOD then you can look for them to FALL. We have taken prayer out of our schools, nativity scenes out of public places, the Ten Commandments out of public buildings, and some are trying to get " In God we Trust" off of our coins. We have democrats who openly support abortion, homosexuality, gay marriage and many other issues that God condemns and finds abhorrent. What can we do???? Well, for one thing, talk to your families, your neighbors, and fight to save your country from a group of evil narcissistic/psychopaths in business suits. 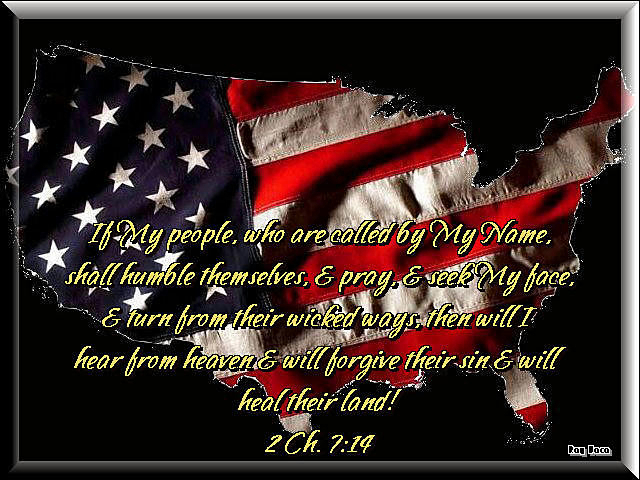 Pray, and ask God to save our nation from itself. Our country is going to loose its freedoms, and you know why? Because we have all but crucified God all over again on the Cross. He has blessed this nation above all others and we are spitting in His face. If you are a real Christian you will recognize that God is leading Donald Trump to restore America back to what she used to be. Which is a Christian nation, under God, who fights for truth and morals and values. And you will be part of the group that HELPS our new President, instead of part of the satanic Democrats who are doing everything they can to destroy him.